The ways of settling the Armenia-Azerbaijan Nagorno-Karabakh conflict are obvious to everyone, said Azerbaijani Foreign Minister Elmar Mammadyarov. Mammadyarov made the remarks at a meeting with a delegation led by Andre Reichardt, head of the Azerbaijan-France Friendship Group in the French Senate, March 10. For a progress to happen in the Nagorno-Karabakh conflict’s settlement, Armenia should show a political will, said Mammadyarov. He also briefed the delegation members about the negotiations on the Nagorno-Karabakh conflict settlement, and Baku’s position, based on the conflict’s settlement in accordance with the norms and principles of international law. For resolving the conflict, Armenia must first withdraw its armed forces from the occupied Azerbaijani territories, the minister said, adding refugees and IDPs must return to their native lands. 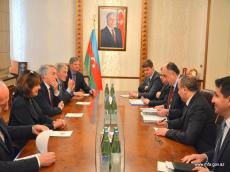 Reichardt for his part said the purpose of his visit to Azerbaijan is to get detailed information about the Azerbaijan-France relations, as well as the process of settlement of the Nagorno-Karabakh conflict. Reichardt added that the parliamentary diplomacy can positively influence the conflict settlement.